Reprise/Original post: I’ve been challenging myself to find THE most affordable, meaningful, creative media that serves as lasting inspiration to kids. Today I’m going to focus on manga graphic novels that ‘Reach and Teach’ in fun, fresh ways…Kids love ’em, educators and orgs are using them, libraries and mobile apps are starting to ‘stock’ them, and Publisher’s Weekly is bullish on them to boot…Is this ‘dumbing down’ or rising up in reaching youth masses? As one who lived overseas for awhile where comic books, Mad Magazine and Snoopy paperbacks were mind candy for me as a child (media was in Japanese so TV was pointless) I realize some of my ‘life lessons’ came from good ol’ Charlie Brown (particularly that kick the football one). Comics have always struck me as an ‘opportunity’ to reach kids in a somewhat subversive way to impart serious content with engaging, whimsy. …Sure enough, they have full color manga graphic novels, (one of the fastest growing kid-lit segments) featuring Great Figures in History including Gandhi, Nelson Mandela, etc. 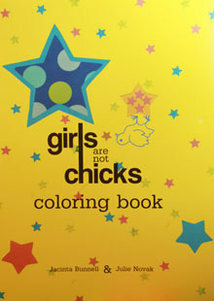 They also have countless other games, posters, coloring books and artsy, imaginative, socially relevant fun fare. …Or well known cartoonist Abby Denson’s graphic novel Tough Love in ‘shounen-ai manga’ melodramatic style about a shy gay teen’s coming-out story and all the complexities faced therein, they have something for everyone…quite literally. Thanks to their wide array of cool offerings, I haven’t set foot in a mall the entire season! I’ve found what little I need for others at purposeful crafts fairs, like the Bazaar Bizarre.org I went to this past weekend, or the Peace & Social Justice faire the week prior where I pretty much found ‘one-stop shopping’ at booths like MeToWe and Reach and Teach as well as their companion sites online. I’ll give you my list of ‘ten under $10’ finds next, but received permission to crosspost this capsulized tidbit on the 18 milestone events in the life of Gandhi as sort of a “Cliff Notes” version for kids that may just have their interest piqued enough to find out more. Not saying kids should have the Iliad and the Odyssey in digestible manga necessarily, just saying it’s a great way to view learning like ‘starter dough’…build on it, stir it, add to it…and it turns into something much bigger and better. That’s using the power of media for positive change…to reach and teach. 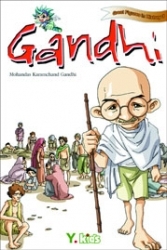 (ref: Great Figures in History: Gandhi – a full-color manga graphic novel from Y.kids, reprinted with permission from co-founders Derrick Kikuchi and Craig Wiesner of Reach and Teach. 1891 June – After attending Inner Temple Law School in the United Kingdom, Gandhi passes the bar exam and becomes a lawyer. Unknown to him at the time, his mother has passed away while he is at school. 1893 – Gandhi is thrown off of a train in South Africa for refusing to move from his First Class seat to Third Class (even though he held a valid First Class ticket). Such discrimination against Indians was common practice and this personal experience gives Gandhi resolve to fight racial discrimination. 1894 – Gandhi founds the Natal Indian Congress to oppose a bill denying Indians the right to vote in South Africa. Although the bill passes, Gandhi successfully focuses a broad range of public attention on injustices against Indians even as far away as India and the UK. 1897 January – Landing in Durban Harbor, South Africa, Gandhi is beaten up by a mob of white settlers. His life is saved when the wife of the Durban Police Chief stands between Gandhi and his attackers. Because of media attention to the event, the colonial government is forced to arrest members of the mob but Gandhi refuses to press charges. Gandhi gains increased public admiration and support. His attackers offer a public apology. 1906 – The South African colonial government enacts the “Asian Population Registration Act” where all residents of Asian countries, including India, had to register their name, age, address, job, and other personal information and carry a card with their finger prints. Gandhi develops his principals of non-violent protest “satyagraha” (devotion to the truth or “soul force”). 1908 August – Gandhi and 2,000 fellow Indians in Johannesburg burn their registration cards in protest. Even as Gandhi and other leaders are repeatedly arrested over 6 years of protest, non-violent rallies continue to grow in size. 1914 – The Asian Population Registration Act is abolished. 1919 – The British Government passes the Rowlatt Act which gives authority and power to arrest people and keep them in prisons without any trial if they are suspected with the charge of terrorism. The Indian National Congress starts the Hartal Movement where thousands of Indians stop working and stop selling and buying British goods in protest. Unfortunately, violent riots also occur. At Amritsar, 379 Indians are killed and 1,000 are seriously injured. 1920 – Gandhi gets people to more intently boycott British products and encourages people to start making their own clothes rather than buying British clothing. 1930 – The British retaliate by passing the Salt Act which makes it illegal for Indians to make their own salt, punishable by at least three years in jail. On March 12th, Gandhi (now 61 years old) travels 320 km (200 miles) on foot for 24 days to Dandi to make his own salt. Others follow. Gandhi is again imprisoned. 1942 – Gandhi launches the Quit India campaign declaring India’s independence from British rule. Gandhi is imprisoned. 1943 – The 73 year old Gandhi starts a hunger strike that lasts for 21 days. 1944 – Fearful that Gandhi would die in prison due to failing health and become a martyr, he and other leaders are released. 1946 March – India becomes an independent nation. 1947 – Tensions between Hindu and Muslim factions resurface and escalate into violence. India is divided into Pakistan and India. The lasting effects of the Indo-Pakistani War of 1947 still affects the geopolitics of this region. 1948 January 12 – Attempting to promote peace and asking that homes be restored to Muslims, payment to Pakistan be made (per an agreement made before the Indo-Pakistani War of 1947), and fighting cease, Gandhi (now 77 years old) starts another fast. Five days into the fast, India makes payment to Pakistan and Hindu, Muslim and Sikh community leaders agree to renounce violence and call for peace. 1948 January 30 – Mohandas Karamchand Gandhi is killed by a member of a Hindu organization angered by Gandhi’s peacemaking efforts. Gandhi was shot on his way to evening prayers. His memory and teachings live on in the non-violent peace movements of today. Learn more about Gandhi’s life by reading Great Figures in History: Gandhi available through Reach and Teach. The Great Figures in History series are manga graphic novels which present a new way for folks of all ages to discover the inspiring lives of some of the most noteworthy people in history. Also check out 20 Quotes from the Nonviolent Resistance Front. Thanks much for the mention of Reach and Teach’s social justice oriented manga products. Just a little off topic but related to your comment about comic books overseas, when I had an opportunity to travel for business regularly (in a past career life) I created a mini-hobby of looking for a specific Garfield comic book wherever I went. It was fun to see the different ways that Odie barked in different languages. It was also interesting to see in some of the panels how humor was localized in each country. I just found your website, and will be coming back regularly to read it as it will be very helpful to my homeschooling family! .-= Alex in Canada´s last blog ..Holiday Lego Fun! =-. Thrilled to hear it Alex…let me know if there are any particular areas of interest that resonate…I’m thinking of adding a few new categories for 2010 to help with clarity…one might be edu/tech innovations…VW, sports, and gender. Any hot buttons we’re not covering in media/mktg. you can add?